The Success Habits of Weight Loss Surgery Patients Educational Program is a researched based, educational offering designed to improve both initial outcomes and long term weight maintenance following weight loss surgery. 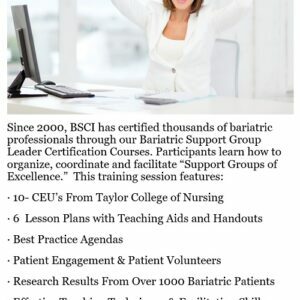 The Success Habits Educational Resources have become an integral part of many bariatric aftercare programs. 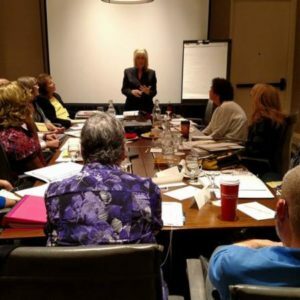 Instructors are required to participate in a comprehensive certification training course where they learn the Success Habits Principles and how to organize, coordinate and facilitate Success Habits Classes, Workshops, & Webinars. In this online certification course, participants will learn the history and research behind the Success Habits of Weight Loss Surgery Principles and become familiar with each concept. Each will prepare and present a lesson via video recording or make arrangements to present to one of our trainers. 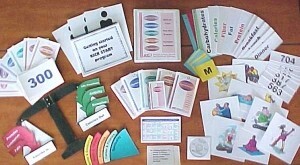 Lesson materials and teaching aids are available as digital downloads. Access to the complete Success Habits Educational Program resources will be granted when participant direction is determined. (i.e. instructor, licensee or program affiliate).